Hidden realm of wonders! The only world capital without traffic lights, Thimphu is a regal yet bustling town amid glorious hills and home to the revered Bhutanese Royal family. Its ‘Shangri-la like’ appearance is embedded not merely in a wealth of historical sights, monasteries and museums, but also in its maze of streets with shops displaying traditional ware, local culture, smiling faces, cuisines and its sporting obsession for archery! At the Aman resorts you know you are in for a magical experience! Set amidst aromatic blue pine-laden hills, this dzong-like architecture houses 16 suites. The Druk Hotel Thimphu is part of Druk group of hotels and is one of the oldest, pioneering hotels in the town, fusing quaint accommodation with Bhutanese hospitality. The newly renovated Hotel Jumolhari has a distinctive boutique style d�cor with traditional Bhutanese hospitability. 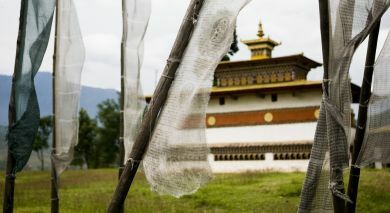 Kisa prides itself in being Bhutanﾒs first designer boutique hotel. 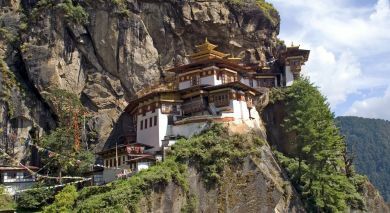 The Taj Tashi is cradled in the mighty Himalayas (fortress of the Gods) in the heart of Thimphu Valley.